The company said sales this year had reached 121bn yuan ($18bn; £14bn), a rise of 32% on last year's sales which were worth $14.3bn. And the event had a blistering start with sales hitting $5bn (£4bn) in the first hour, Alibaba said, though that total included pre-orders made by customers who could "lock in" prices. It took 90 minutes to hit that milestone in 2015. Originally claimed as a celebration for China's young singletons, Alibaba turned it into a shopping bonanza in 2009. Alibaba's rival JD.com, which focuses more on electronics, reported receiving more orders in the first nine hours of trading on Friday than it had done during the whole of Singles Day 2014. It said sales passed last year's Singles Day total in the early afternoon, but gave no figures. Patty Cao, an analyst at Aberdeen Asset Management, said that the pace of Alibaba sales "show that Singles Day might be the ultimate symbol of how the Chinese economy is changing". She said: "Alibaba is a bit of a bellwether for the country's consumer... China is trying shift the economy away from a reliance on investment and manufacturing towards one driven by consumer spending and services. "It's not been plain sailing. Growth has taken a significant hit. So events like Singles Day are important indicators to feel the pulse of China's economy." Obsessive shoppers have been lamenting for years that they should cut off their "unstoppable hands" because they end up buying far more than they actually need. But this year, they were joining in on the shopping frenzy again. Analysts had predicted this year's event could see Alibaba rack up sales of $20bn despite a slowdown in China's economy, partly due to the event having a broader audience. 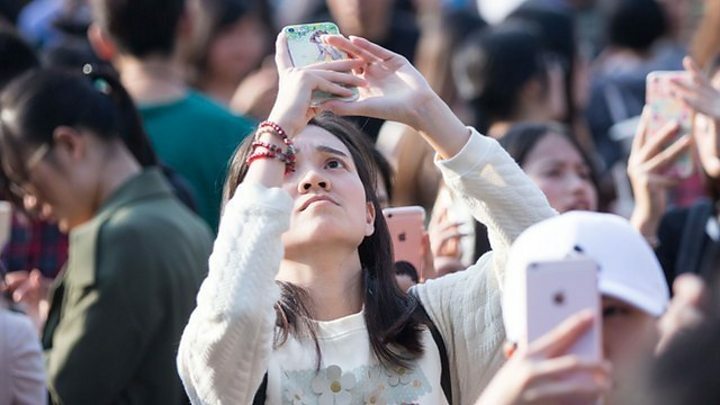 "We're seeing an even bigger shift from offline shopping to online shopping," Kitty Fok, managing director of IDC China told the BBC. "And there is also more of a focus on rural areas. People in the villages who could not do online shopping now have mobile phones and so can do that."